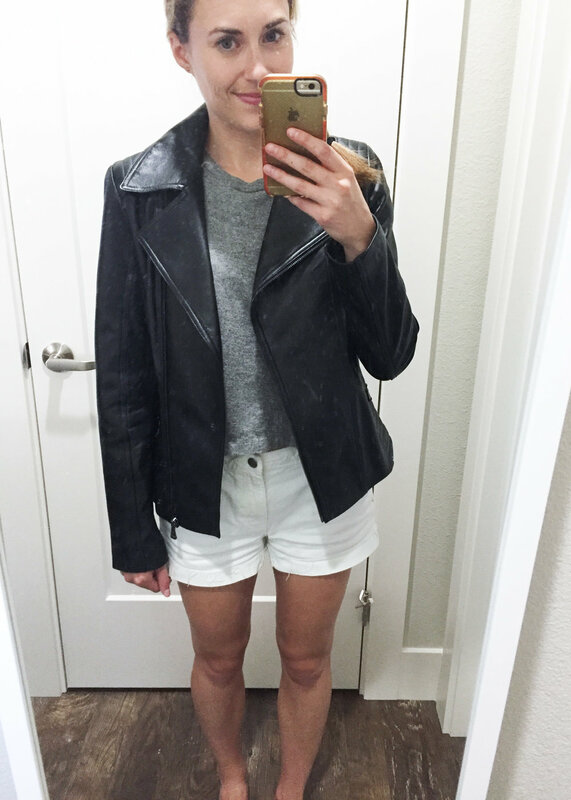 I'm kind of embarrassed to admit that I'm having a bit of an existential crisis over leather jackets right now. 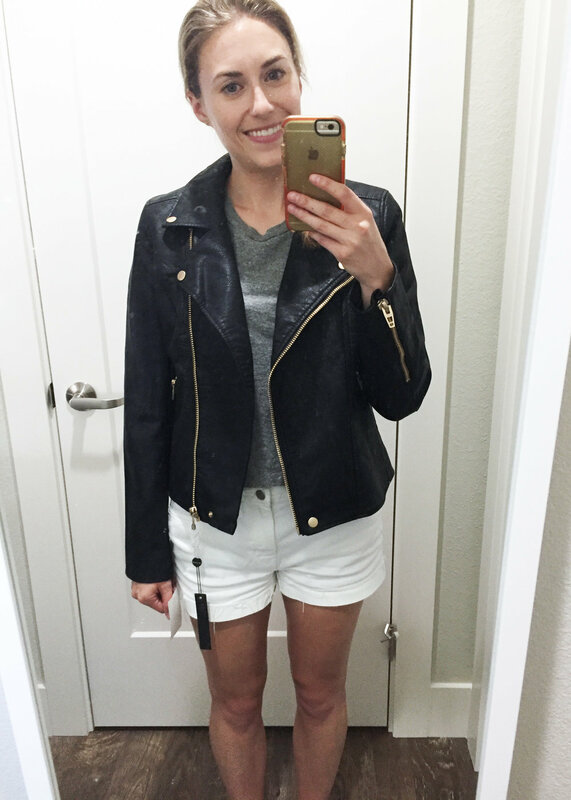 I purchased my current leather jacket (last seen here) a couple of years ago, and it has served me well since then but I've never been totally in love with the fit. Because of that, I ordered a faux leather jacket during the Nordstrom Anniversary Sale that looked promising, but I'm still not sure if it's the one for me. I've had my eyes on a version from Amour Vert made out of recycled leather for over a year now, but I'm second guessing that, too... 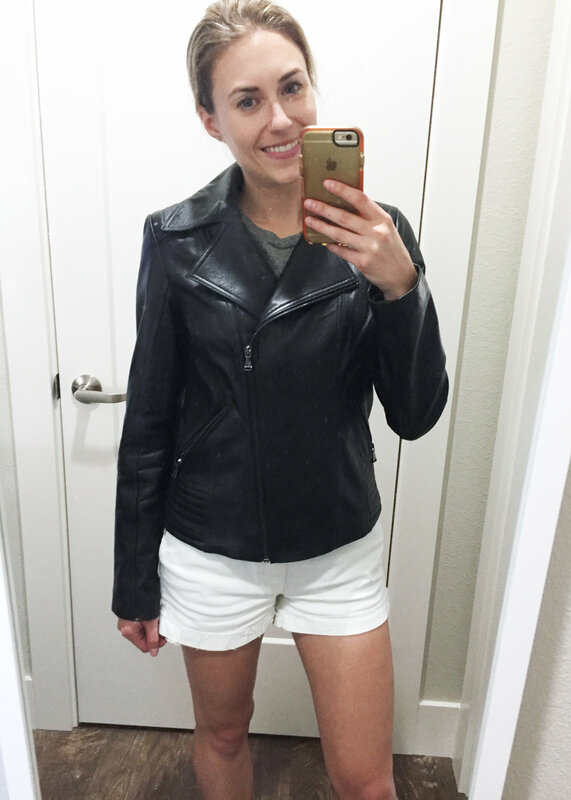 I'm probably overthinking this whole thing considering that I doubt I'll love only one leather jacket forever, but I need help! Here's the original purchase: a Guess brand genuine leather jacket that I picked up on sale from Wilsons Leather a couple of years ago. I love the feel of the jacket and how the hardware doesn't stand out, but I'm not crazy about the fit. It fits well when it's zipped up, but it looks big when it's unzipped. (But does there exist a jacket that can fit well both ways...? That's my dream.) The arms are also a tad long and wide on me. That said, I like how it has minimal embellishments (belts, straps, zippers, etc.) but it does have some detail in the shoulder stitching and around the waist. 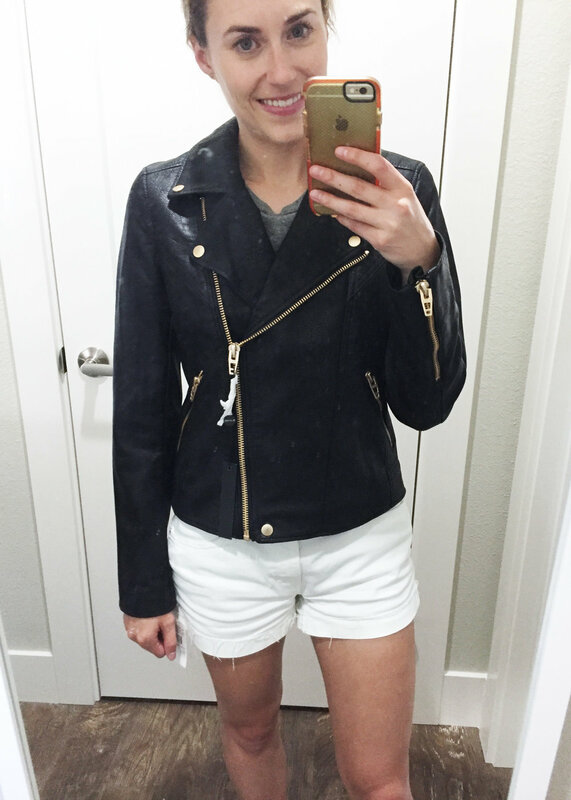 When this jacket appeared as part of the recent Nordstrom Anniversary Sale, I jumped on it. I originally received the wrong size—XS when I had ordered S—but like I assumed, the XS didn't work. The XS fit well everywhere but on the shoulders and I realized that doesn't work for me. I had to place three more orders for it as it came back in stock before Nordstrom actually shipped it. As far as faux leather goes, it seems nice and not at all plastic-y, but it's not nearly as supple as my Guess jacket. I especially loved it for the gold hardware! I hadn't seen a reasonably-priced leather jacket with gold hardware, so I thought I'd give it a shot since I'm not 100% a fan of silver hardware. The fit of this jacket is a bit smaller than my Guess jacket all around, but the arms are still slightly wide and long. I really like how it doesn't look too big when I leave it open. This is what I thought was my dream leather jacket after deciding that there was no way I'd ever be able to afford Madewell's leather jacket. This one is still a pretty penny, but I'm attracted to the way it fits the model and the fact that it's made from recycled leather. I always envisioned a leather jacket that fits snug on me rather than loose and that had snug arms and sleeves that hit just past my wrist bones. This one seemed like it would check those boxes, but Amour Vert shot new product photos recently and now I'm not so sure... Also, are the embellishments too much? Even thought I've dreamt about this jacket for months now and slightly panicked each time it sold out, I'm now hesitating. I have to decide. Do I keep the BlankNYC jacket and assume I'll only have it "for now" and not forever or do I let it go and wait for the right one to come along while still wearing my Guess jacket when the mood strikes? Or do I forget both and try the Deadwood jacket? Or do I splurge on the Madewell jacket? (I wish...) Sometimes I feel silly for putting so much thought into one garment but I really would like a leather jacket that is relatively timeless and has the fit that I want. This post was mostly just to brain dump everything so I can think through things more clearly, haha.